A new survey conducted by Abacus Data finds that opposition to the takeover of Canadian energy company Nexen by Chinese energy company CNOOC Ltd has increased by 12 percentage points since August. Overall, two in three Canadians surveyed (69%) said that the federal government should reject the deal while 8% said the government should approve the deal. Twenty-three percent were unsure of what the government should do. Last month, Abacus Data found that 57% of Canadians believed the federal government should reject the deal, a 12 point increase. The survey found that awareness of the deal increased only marginally from 43% in August to 47% this month. Awareness was highest in Alberta (63%), among Canadians aged 60 and over (59%), and among market watchers or those who said they follow the stock market very or somewhat closely (71% and 72% aware). 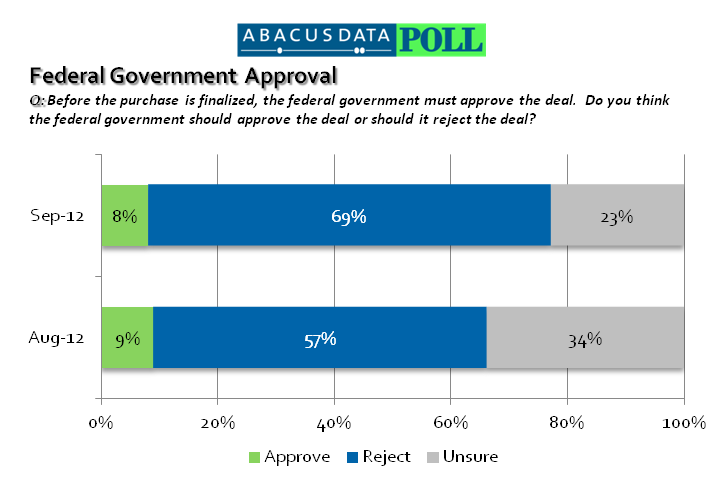 When asked whether the federal government should approve the deal, 69% said the deal should be rejected while 8% believed it should be approved. Opposition to the deal was uniform across most subgroups. There were few regional or partisan differences. In fact, respondents who said they voted Conservative in 2011 were almost as likely to say the deal should be rejected as those who voted Liberal or NDP (Conservative 68%, NDP 72%, Liberal 73%). Of note, those respondents who follow the stock market very closely were the most likely to believe the deal should be approved (26% approve, 58% reject). Those who believed the deal should be rejected by the federal government where shown a list of four reasons why they may be opposed and were asked which reason, if any, came closest to their view. Results indicate that opposition is driven more by concern about a foreign company controlling a strategic asset than by that foreign company being Chinese controlled. A majority of those opposed to the deal (58%) cited the fact that Nexen operates in one of Canada’s core strategic industries, and a foreign company should not have control of such an important resource. Another 15% of those who believed the deal should be rejected did so because CNOOC is owned by the Chinese government and the resource will be used as an instrument of Chinese policy. Fifteen percent were opposed due to China’s poor human rights record while 9% cited the lack of Canadian-Chinese reciprocity when it comes to controlling Chinese companies. Overall, few Canadians view China negatively however few view it positively. When asked to rate their impression of China on a scale from 0 to 100, where 0 meant very negative and 100 mean very positive, 34% gave a rating of 0 to 33 (considered negative), 47% rated their impression between 34 and 66 (considered neutral), and 18% rated their impression between 67 and 100 (considered positive). There was only a weak correlation between a respondent’s view about China and their position on the Nexen/CNOOC deal. Those who held more positive impressions were somewhat more likely to believe the government should be approve the deal but the relationship was not perfect. 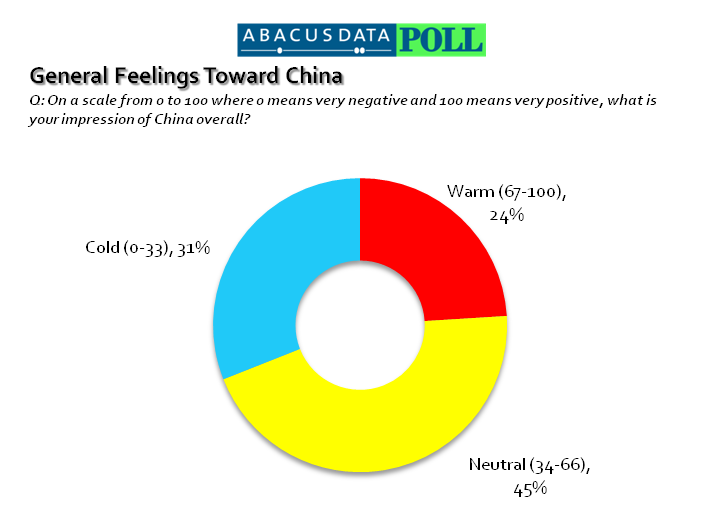 Among those with positive impressions of China, 48% still believed the deal should be rejected by the federal government. Respondents were also asked to rate their comfort with Chinese state-controlled companies investing in and purchasing Canadian natural resource companies. Overall, a majority of Canadians said they were either very or somewhat uncomfortable with either idea. Sixty-five percent said they were uncomfortable with Chinese investment in Canadian natural resource companies while 73% were uncomfortable with Chinese companies buying Canadian natural resource companies. As the federal government decides whether to approve or reject CNOOC’s offer to purchase Nexen, Canadian public opinion is a hurdle for the government. Not only do opposition party supporters want the government to reject the deal but a majority of Conservative Party supporters want the deal to be rejected as well. Although the issue has not reached a level of awareness that should be considered worrying for the government, there is potential for the issue to become political charged, especially if the opposition parties take advantage of the public’s initial negative reaction to the deal. Most Canadians are not deeply aware of the issue but our research suggests that when Canadians are given some information, most respond negatively. Even among those who are likely to be most informed about business issues, like those who say they follow the market closely, a majority believe the Nexen deal should be rejected. This means that even if the government is successful at communicating of the benefits of the deal, Canadians may agree. This presents a major communications challenge. Our research also indicates that opposition to the deal is not being driven by negative attitudes towards China. Canadians are not necessarily uncomfortable with Chinese investment in Canadian industries in general. They are however uncomfortable with the idea of state-controlled companies controlling a major player in one of Canada’s core strategic industries. If the federal government does approve the deal, they will have a lot of work to do in convincing Canadians in all regions and of all political stripes of the merit of their decision. The survey was conducted online with 1,208 respondents in English and French using an internet survey programmed and collected by Abacus Data. A random sample of panelists from the Angus Reid Forum was invited to participate in the survey, a representative panel of over 150,000 Canadians. The survey was completed from September 14-18, 2012. The margin of error for a survey of 1,208 respondents using a probability sample is +/- 2.9%, 19 times out of 20. These questions were posed as part of the Abacus Data monthly Omnibus survey. The earlier survey (n=2,099) referenced in this report was conducted from August 10-12, 2012 using a similar methodology. Details can be found on the Abacus Data website.